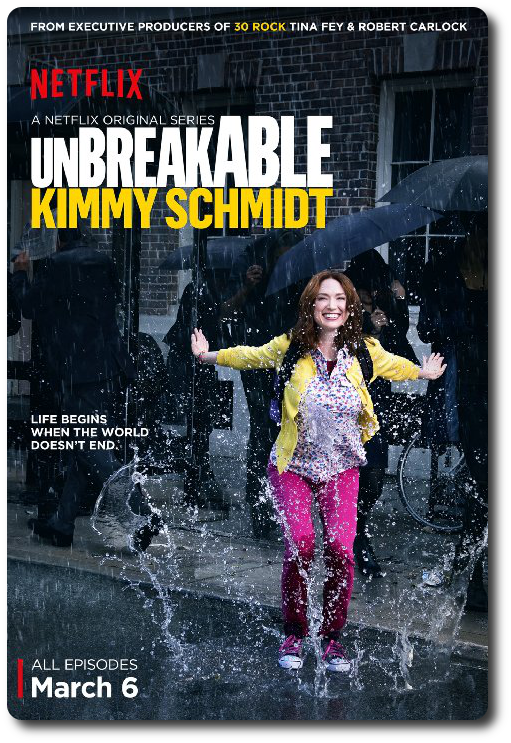 Have you guys streamed the new Netflix Original Series, Unbreakable Kimmy Schmidt yet? Let me just give you a heads up that if you were a fan of 30 Rock, The Mindy Project or The Office you're going to love this show. Now, I was a huge fan of the character, Erin, from The Office. She was a bit ditsy, clumsy and out there, but she also was hilarious and had a big heart. So when I saw that the hilarious actress, Ellie Kemp, who played Erin would be starring in her own show, Unbreakable Kimmy Schmidt, I knew I Would love it. After being rescued from an underground bunker where she stayed the past 15 years in, Kimmy Schmidt decides to live in New York to have a normal life. She makes friends with her new roommate Titus, and works as a babysitter for Jacqueline Voorhees, a wife of a millionaire which has many issues. While many obstacles are thrown in her way, Kimmy makes the best of her new life while having to adapt to the new world. Being that I am part of the Netflix Stream Team, I was able to watch season one before it went streaming on Netflix for everyone to view and let me just say that I was laughing hysterically at my desk watching the show. If you want to know what a girl straight out of the 90's would do in today's selfie crazed society that we're in now, this is a must see. The show follows Kimmy after she is rescued from a cult and decides to live in New York City. She finds a crazy, drama filled roommate, Tituss, to live with and becomes a nanny for a rich family. Between helping the family she works solve their many problems and helping her roommate trying to land an audition for just about anything, Kimmy is still trying to figure out herself and what she wants in life. She refers to one of the books from The Babysitters Club (an overdue library book she's had since before she was kidnapped) for lots of problems that she face in today's world. It's awesome because the lessons she takes from the book help her with tough decisions she has to make. This show starts off kind of slow, just like every show does. It takes a bit to get use to and if you don't like comedy, this may not be the show for you, but it is a great show that I'm already looking forward to season two. It's hilarious, cheesy and randomly has 90's phrases we use to say back in the day. I love it!